Farewell to the old home. It is 1976. We had lived in our first home since we married in 1971. Now we were saying farewell, ready to move into our present home. There’s my wife sitting on the floor. Knock down furniture had been taken apart for removal. Pictures were off the wall. There was a clutter of cardboard boxes. But now for something to amuse. We still have the same L S Lowry print hanging on the wall. It has faded quite a bit in the last 40 years. We still have much of the same furniture. Stool, chairs and coffee table all exist still. We had that rug then too. The chairs and the sofa have been reupholstered twice. The knock down furniture is still up and in the orange colour we had chosen then to match the furniture. They have been relegated to a spare room, along with the same curtains. Actually, the carpet in that room is also still the same as the one my wife sat on in 1976. There’s a blue suitcase in the 1976 picture. That is in use as a container in our loft. I can recognise that in front of it is the gramophone I still use – a battery electric one rather than a wind up. And of course, I still have my wife or should I say we still have each other. The French phrase is plus ça change, plus c’est la même chose which means the more things change, the more they stay the same. Perhaps in my house we’d better say the times change but the things stay the same. Father in Law spent time in the Faroe Islands towards the end of World War 2. He was a radio operator in the RAF and was able to help have knowledge of what was going on in the North Atlantic – a vital zone for preventing supplies reaching Germany. He took quite a lot of photos – a sort of snapshot of Faroese life just over 70 years ago. It is now more than ten years since we were there at times tracing his footsteps. Doug (Father in Law) took a photo of Faroese sheep. He captioned his photos and here we have two captions for this one. We were not there in spring so I can’t match his cute lamb. But sheep still scratch a living on the hillsides of the islands and here’s my photo. What a gorgeous beast. The owner has had to trim the horns. Sometimes a curly horn can point straight into the face of the animal and keep growing. Trimming the horn is not a problem. These sheep aren’t particularly tame. Getting close can be a problem. Our visit to the Faroe Islands was interesting. Much had changed since Doug’s time, but much still remained the same. We’ll start with one of those railway carriage prints and it depicts, as the name implies, travel back in 1905. What we see here is a Midland compound loco on a Manchester express near Millers Dale in Derbyshire. The loco was said to be new back then. It still exists for it became a part of the nationally preserved collection of locos. The print does not date from 1905. It was issued in 1951 by the London Midland region of British Railways. The original art work was by Hamilton Ellis and was part of a series of ‘travel in’ prints used. I reckon this particular copy has suffered fading. The loco and carriages ought to be in a crimson colour. If you search for this item on the web you’ll see what it would have looked like when new. But I rather like the more subdued colours here. Sadly, the old Midland Railway route to Manchester was closed in 1968. Parts of it have been restored as heritage lines and much of the area in Derbyshire is now a footpath – the Monsal Trail. Back in 2008 we walked some of this including a stretch at Millers Dale. That scene, taken from the track, could be very close to where Hamilton Ellis set his scene. This is Millers Dale station with a platform edge, the remains of buildings some being used by builders, but no tracks and no trains. You have to forgive yourself past mistakes and I certainly made one when repairing an old map with sellotape. I’d have been about 12 at the time so that was over fifty years ago. I bought the map – probably just about given away – at a jumble sale. It was a map of the railway network of Great Britain and it showed the new grouping. Before the First World War there had been dozens of privately owned railway companies. My favourite company from that time (always ancient history to me) was the London, Brighton and South Coast Railway. I lived roughly in the middle of what had been its area and even though my memories start 30 years after the demise of the old company there were still locos and carriages from that long gone era around. During World War One the railways were taken over by the government and then, in 1923, they were returned into private ownership. But it was thought that small companies, like my favoured Brighton one, would never have the resources to manage well so all of the dozens of old companies were merged into the ’Big 4’. These were largely regionally based. Again, my favourite was the one in the area I lived and was called the Southern Railway which incorporated the old Brighton company, along with others and it operated trains south of London from Kent to Cornwall. My map was to show this new grouping of railways. 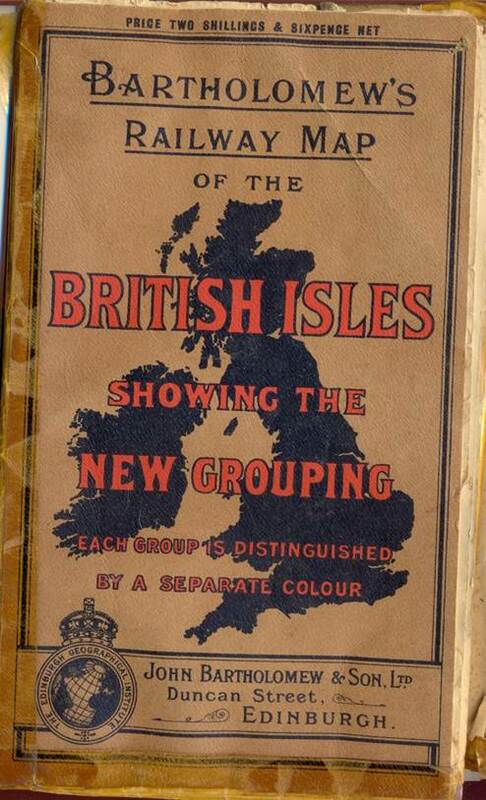 As this took place in 1923 the map must date from about then. That’s the map cover today showing my awful sellotape damage. And here’s a little section of the map. 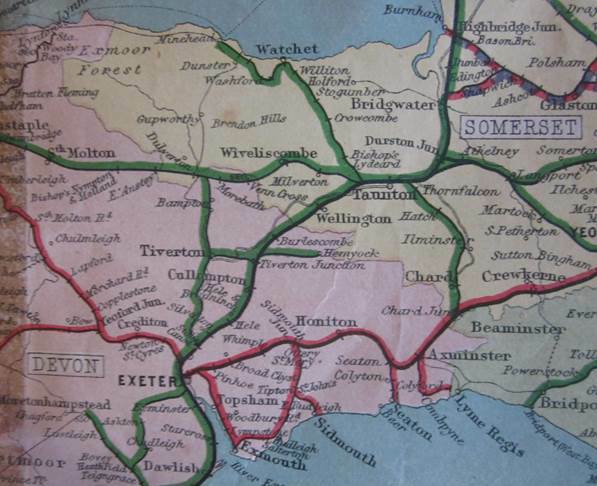 The lines shown in red are those of the Southern Railway whilst the green routes belonged to the Great Western Railway. One line is shown in red and blue dashes. This was a joint line owned by the Southern Railway and the huge London, Midland and Scottish Railway. Each of the counties is shown in colour so here we see parts of Devon, Somerset and Dorset. Just for interest here’s much the same area 90 years on, in 2013. There are a lot fewer lines than there used to be! Back in the 1980s – a generation ago – we took our family camping on the south side of the Mawddach estuary for three years running. It was a quiet and undisturbed area with bustling Barmouth less than a mile away across the footbridge next to the railway line. I think we must have been up near Llynau Cregennen, above Arthog when this photo was taken. That’s my daughter on the left looking about the age her son does now. I have to say she is also looking cold. A wooded hump rises up from by the water. That is Fegla Fawr – a hill we camped on. To the right of that a black line goes across the water and that is Barmouth Bridge. This spans the estuary. 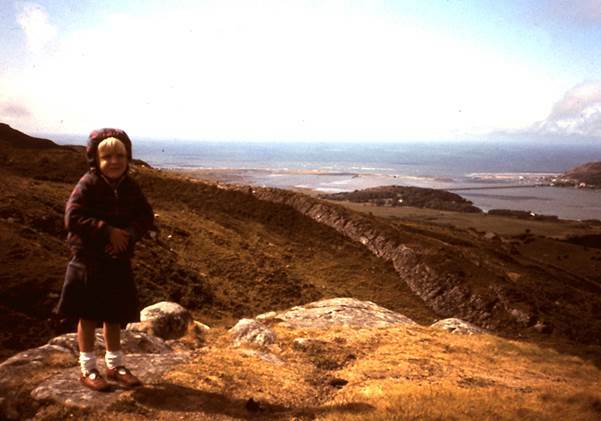 We can also see, just alongside my daughter’s head and going into the centre of the photo the Fairbourne spit which goes nearly all the way to Barmouth. I’ve called this a ‘then and now’ but I don’t have a now view. Instead I have the opposite view from Barmouth, across the bridge, over Fegla Fawr and up into the mountains. The bridge passes in front of Fegla Fawr. Llynau Cregennen is high up in the mountains beyond. It is a beautiful part of the world and people speak the Welsh language there. I may not understand what they say but by golly it sounds so beautiful and most folks can speak English and they do to we English folk. Pronunciation is different in Wales too. We learned some things quite quickly back in the 1980s. The nearest railway station to where we camped was and still is Morfa Mawddach. It’s a request stop. If you want to get off the train there you have to tell the guard in advance so he (it was still all men back then) can ensure the train stops. We recall the first time and we told the guard we wished to get off at More fir more datch. Eventually he understood and said, ‘Ah! You mean more var mouthe ack’. We don’t pretend to be any good at Welsh but because road signs are bilingual we have learned many words and mostly we think we pronounce them tolerably well.